With very attractive white flowers blushed with pink, Camellia sasanqua Paradise Blush is a very attractive and versatile evergreen shrub. In our mind ‘Paradise Blush’ is one of the best Camellias for use as a flowering hedging plant. Flowers are a clean white with blushes of pink on the reverse, semi double and opening from attractive pink buds. Foliage is a good mid to deep green and reasonably small which makes it well suited to clipping and pruning into semi formal hedges. This is a long flowering Sasanqua type Camellia, the main flush of flowers will be in winter, however spot flowering through the year is common. Foliage is naturally dense and with gentle pruning from a young age the plant can form a good screen. Used as a hedging plant, space Camellia sasanqua Paradise Blush at around 1 metre centres for a great effect. As with all Sasanqua types, Paradise Blush requires a humus rich well drained soil. Prepare the planting area by adding some well rotted compost and aged cow manure a few weeks prior to planting. Young plants should be staked to help form a good upright structure. Planting distance of Camellia sasanqua Paradise Blush should be at 1m apart for a good dense hedge.For a faster effect try 75cm. Water in well with a liquid seaweed fertiliser and deep water through the first summer every week if the soil begins to dry. Do not over water as this will cause root problems. 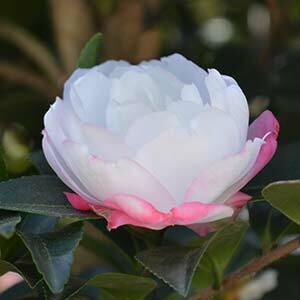 Mulch around Camellia sasanqua Paradise Blush to help maintain moisture and a cool root run. Fertilise each spring with a specialist camellia fertiliser, repeat the fertiliser application in early summer. Make sure you water the plant eel before and after applying fertiliser. Do not over fertilise as this can cause root burn. The best time to prune Camellia sasanqua Paradise Blush is immediately after the main flush of flowers in winter to spring. Regular light tip pruning is the best method. Heavy pruning in spring may limit flowering the following year. In generalParadise Blush hedges can be pruned once or twice a year. Suited to growing as a specimen plant in a lawn or the garden border. Also useful as a hedge or screening plant. Excellent as a background plant in the garden border and also suited to growing in containers. 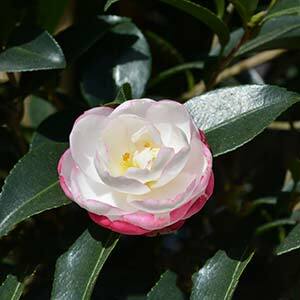 Camellia sasanqua Paradise Blush has a naturally good upright habit, growth rate is medium to fast, and it is easy care. Perhaps underused by landscapers who have not discovered this variety and its many benefits. Height – Will reach around 3 meters, taller in good conditions, however easily pruned. Spread – Will spread to 2 -3 metres. Soil – Humus rich well drained slightly acidic. Position – Plant in full sun to a little afternoon shade. Drought Tolerance – Reasonably drought tolerant once established. Frost tolerant – Tolerant of light frosts once established. Container growing – Camellia sasanqua Paradise Blush is suited to growing in containers or pots.